This diagram shows some of the key ways that video signals may be sent to mobile telephones. This example shows that a video signal may be sent directly to a cellular system which is transferred to the mobile telephone over the same radio channel as the voice telephone service. Another option for sending video signals (such as DVB-H) is to send the video signals on a separate frequency band. Some mobile telephones have been designed to receive satellite video signals in addition to their voice telephone signals. This figure shows how streaming media is sent to mobile multimedia telephones. This diagram shows how a media service is providing a continuous stream of packets to the mobile device. This diagram shows that some of these packets are delayed in routing and some packets are lost during transmission. As an option, streaming media session may include a flow of status control information from the receiving device to the server indicating the quality of the streaming data connection. This can allow the media server to adjust its data transmission rate to accommodate changing transmission characteristics. 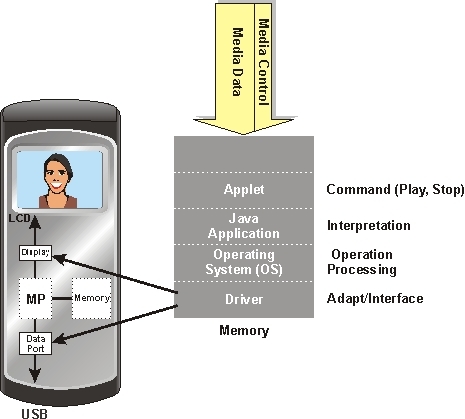 This figure shows the basic structure of a mobile video Java media player. This diagram shows that a mobile device contains a microprocessor (uP), memory that holds software program instructions and data and display and data port adapter functions. The Java media player is a small program (Applet) that uses the standard Java programming language to provide media player functions on the mobile device. When media stream is received to the media player (such as Play or Stop), the Applet converts these media control commands into instructions the Java application can understand. The Java program then converts (interprets) these commands into a form that the operating system can understand and the operating system sends information to the specific devices (such as the LCD display) using driver software that converts the information into a format that can be used by the specific device (such as a small color LCD display). Mr. Lawrence Harte is the president of Althos, an expert information provider covering the communications industry. He has over 29 years of technology analysis, development, implementation, and business management experience. He has setup, managed, and provided training for keyword advertising, search engine optimization, affiliate links, email broadcasting marketing programs. Mr. Harte has interviewed hundreds of Internet web marketing experts and tested many types of web marketing systems to discover the key success principles used for Internet marketing programs. Mr. Harte's combined knowledge and experience in business systems, communications technologies allow him to communicate well with all people within a company that have a need to understand marketing programs and communication systems. He has authored over 80 books on communications technologies and systems on topics including Internet Marketing, Business Finance, Mobile Communications, IP Telephony, and Billing Systems. Mr. Harte holds many degrees and certificates include an Executive MBA from Wake Forest University (1995) and a BSET from the University of the State of New York, (1990). Stephen Clee is the managing director of Datmedia, Ltd. Stephen has considerable expertise in the areas of interactive online multi-media. He was part the UK�s first internet radio station launched in 1996 (Interface Radio) and his team has performed many firsts in internet broadcasting. Stephen Clee has played an instrumental role in the early broadcasts of perpetual 24/7 radio (audio) and his Interface team went on to perform many other firsts in internet broadcasting. Stephen set up Datmedia (www.datmedia.co.uk) in 2000 to develop the next generation of interactive online audio-video broadcasting tools. Datmedia now provides e-learning solutions in the form of its unique datpresenter� software (www.datpresenter.com). Stephen has considerable expertise in the areas of interactive online multi-media. Introduction to Mobile Video explains how to send video and television to mobile telephones on 2nd and 3rd generation wireless systems. You will learn about the key available video transmission options. 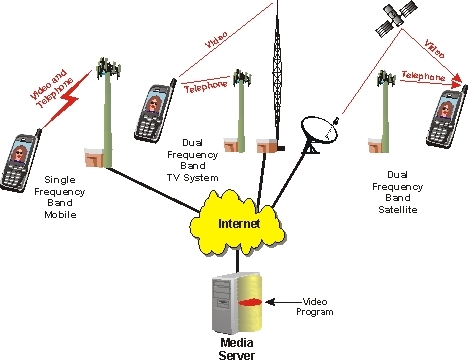 These include sending telephone and video signals on the same mobile radio channel, using dual frequency mobiles to allow access to mobile telephone systems and land based television transmission systems (such as DVB-H) and dual mode mobile to allow access to mobile telephone and satellite based television systems. Described are the key mobile video applications including sending video clips, live TV, video messaging, and multi party gaming. The fundamentals of sending mobile video including circuit switched video, packet video, video and audio compression, audio quality, video quality, multiplexing voice and video services, and channel setup and control is provided. Explained are the core technologies that are used for mobile video including video compression, audio compression, multimedia transmission, and media players that can be used for small portable electronics devices. Discover the different types of media formats that can be used by mobile devices and the types operating systems and media players they can use. You will learn about how to overcome the challenges of limited processing power and battery life in mobile devices and how to provide a good viewing experience while saving battery life.